We first heard of the Huawei Honor Magic 2 at the IFA 2018 conference in Berlin three months ago, and then many leaks and rumors about this Honor Magic 2 phone began to spread. 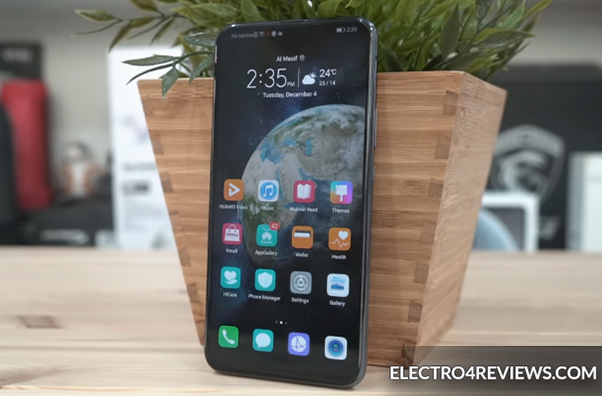 After Huawei's Honor officially launched the phone, the Huawei Honor Magic 2 phone proved truly impressive and impressive thanks to the new technology in the door, which puts it in competition with the smartphones of other companies. 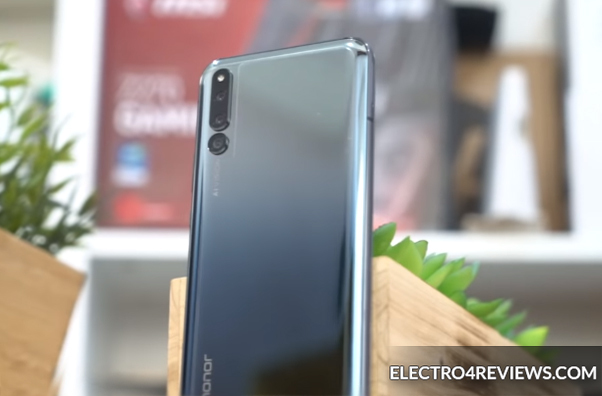 The front of the Huawei Honor Magic 2 phone is equipped with a smart sliding mechanism that includes the headset and three cameras including a face recognition device that is used to unlock the phone. You can also use the fingerprint sensor installed under the screen to unlock the Huawei Honor phone. On the Honor Magic 2 rear, it comes with a sleek design with a gradient coating that gives you a different color when you turn your phone on the sun, in addition to having a tri-camera setting associated with the LED flash. 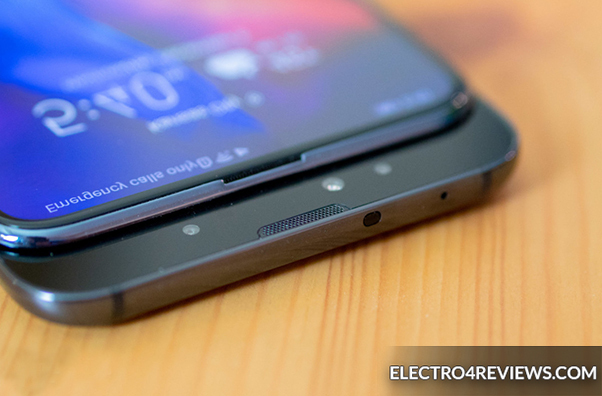 Interestingly enough, Honor added a black matte case to the phone. 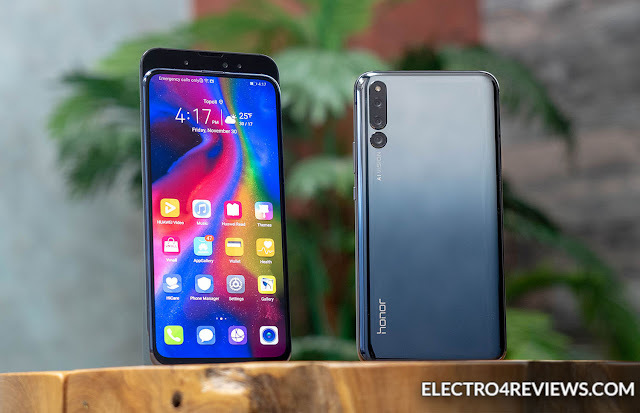 honor mobile : From the bottom you will find the external speakers as well as the USB-C port that is used to charge the phone or to connect the headphones to it via an adapter because there is no headphone jack or you can use wireless headphones instead. 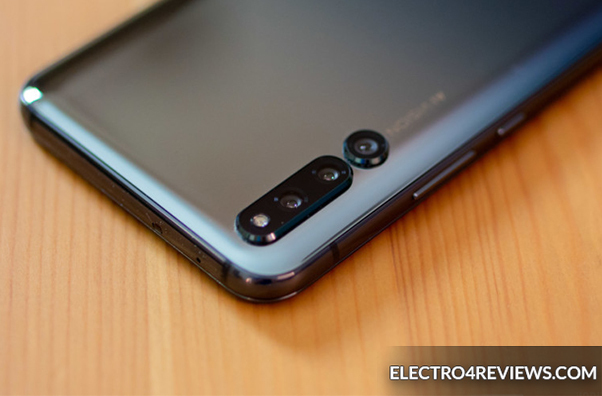 Huawei Honor Magic 2 : On the right side you will find the power button and the volume control buttons that function with excellent response, and from the right side there is a SIM insert port. Honor smartphone is available in black, in addition to blue and red. 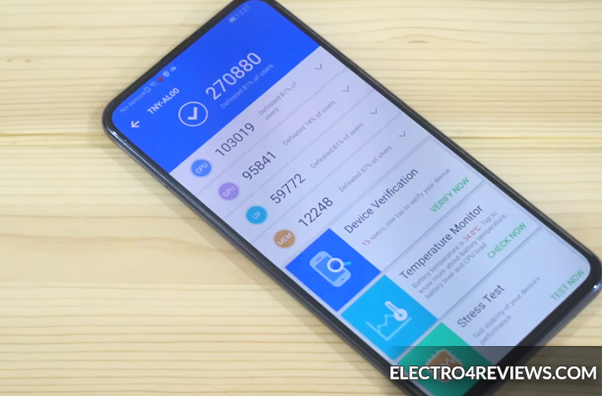 Unfortunately, the Honor Magic 2 phone does not support any standard for water resistance. The Huawei Honor Magic 2 phone offers a 6.39 "AMOLED screen of 1080 x 2340 pixels with a 4.3x pixel resolution with a 19: 5: 9 aspect ratio, and the screen covers 84.8% of the handset and has no bump. The Honor Magic 2 screen is stunning in terms of depth, angle of view, brightness and color. It supports about 16 million colors as well as the multi-touch feature and the DCI-P3 color range. You can activate Eye Comfort through the settings for viewing or reading for long hours, and you can activate the Ambient feature which will be very useful with the AMOLED screen. The Huawei Honor Magic 2 Review comes with six cameras; three on the front and three on the back. The Honor Magic 2 rear camera setup provides a 16 megapixel camera with a f / 1.8 slot and a 16 megapixel camera with a f / 2.2 lens slot. In addition to a 24 megapixel black and white camera with a f / 1.8 lens slot, Is associated with a LED flash. The Huawei Honor rear camera supports HDR and panorama mode, but unfortunately there is no optical fixer. The Huawei Honor quality of video shooting with the rear camera is 2160 pixels at 30 frames per second, 1080 pixels at 30 frames per second, or 720 pixels at 480 frames per second. The Honor front camera is equipped with a 16 megapixel f / 2.0 main camera, a secondary 2 megapixel camera with a f / 2.4 lens slot, and a second 2 megapixel camera with f / 2.4 lens slot. The Honor phone camera supports front-end shooting mode and HDR portraiture, as it is specialized for face recognition. The Honor new phone video quality of the front camera is 1080p at 30 frames per second. The latest Honor phone update added a new feature to the camera that allows you to see calories to eat using artificial intelligence. The Honor Magic 2 phone works with the HiSilicon Kirin 980 8-nm processor with a 7 nm manufacturing process, which will provide you with all the technologies you need. The Honor cell phone is powered by Android Pie version 9.0, the EMUI 9.0 user interface, and the Magic UI 2.0. The Honor mobile phone is available with 8GB of RAM with 128GB or 256GB internal memory, plus a choice of 6 GB of RAM and 128 internal memory. Unfortunately, there is no possibility of adding an external memory card. The Huawei Honor phone supports Wi-Fi 802.11, Bluetooth version 5.0, GPS and NFC. The Honor Magic 2 comes with a powerful 3500 mA non-removable battery that will give you 6 hours of screen operation. The phone supports 50 watts of fast charging, but there is no support for wireless charging technology. For The Honor Magic 2 prices, it starts at about 545 $ for a version 6 with 128 GB, and up to 690 $ for 8 with 256 GB. ✔ The design is stylish and stunning. ✔ Setting up a great camera. ✔ Lack of water resistance standard. ✔ Lack of wireless charging technology. ✔ Limited options for sliding mechanism. ✔ Its size is a bit heavy. The HONOR MAGIC 2 phone is a very convenient phone for many people. It features the amazing VIVO NEX S phone and the stylish OPPO FIND X, and it delivers superior performance. There may be some operating system bugs, but in fact it's the best phone HONOR has launched so far.